When winning Democratic manager Rep. Mike Doyle gave the Congressional Baseball Game trophy to his counterpart, Rep. Joe L. Barton, to put in Rep. Steve Scalise’s office while he is recovering, it summed up the feeling of the evening. “It’s so awesome to show everyone that we actually get along and I want that to be the message that everyone takes away tonight,” Illinois Rep. Rodney Davis said after the game. 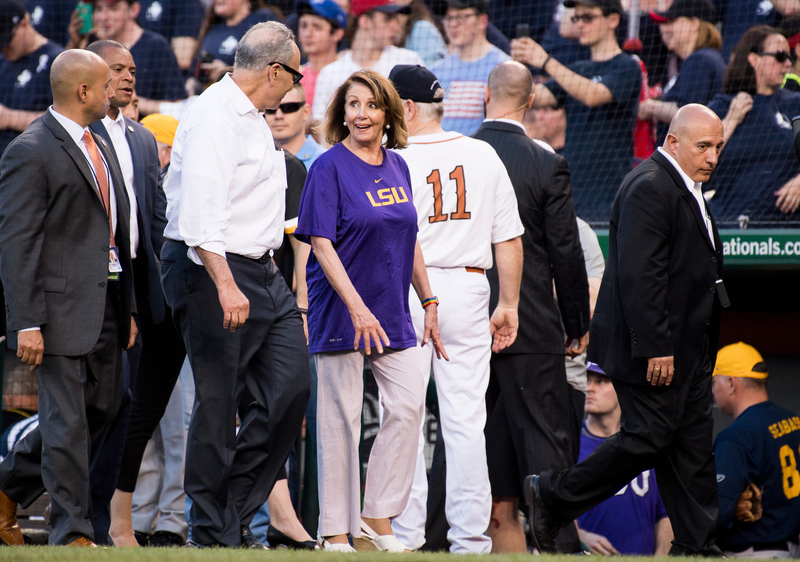 The Democrats crushed the Republicans, 11-2, but that wasn’t the focus of the post-game chatter. The missing presence of Scalise, who was hit by a bullet in the hip and underwent his third surgery in two days shortly before the game. When news broke that Scalise had come out of surgery and his condition had improved, it quickly reached the Republican dugout. Two others who were wounded were there, though: Williams’ staffer Zach Barth, and Capitol Police officer David Bailey, who threw out the game’s first pitch. Barth and his boss walked out on crutches together following the game. Barth said he never expected to hear an entire stadium cheer for him. 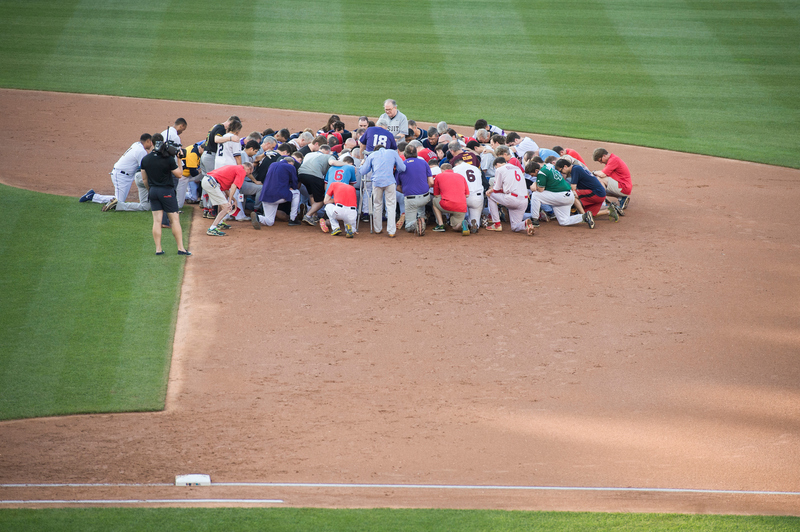 Another touching moment was when both teams met at second base to pray for Scalise. 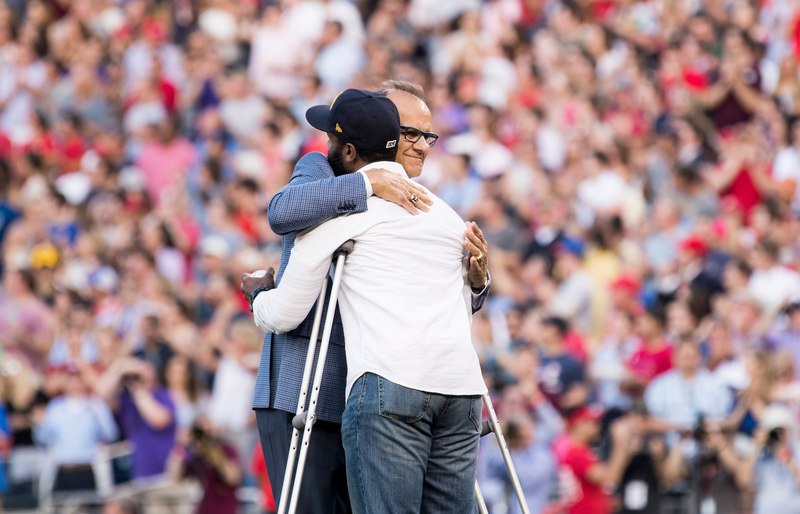 “It was the prayer out on second base that was pretty moving. I think it hit everybody when you realized that we had this whole thing going and Steve wasn’t there,” Pennsylvania Rep. Pat Meehan said. “He was there in spirit but you just keep waiting for him to turn the corner and be in the dugout. The prayerful atmosphere at the beginning of the game turned into a positive and patriotic feeling for the rest of it. While staffers cheered for their bosses, they were louder cheering for Bailey and Barth. One of the game’s longest-playing veterans, Republican Rep. Kevin Brady of Texas, has never seen a crowd like Thursday’s record attendance of nearly 25,000 in his 21 years on the GOP team. The somber, yet proud and unified feeling, overcame the Republicans as they walked through the stadium at the end of the game. “I’m not so happy about the loss, but I’m pretty happy we played the game. I think it was a great experience for everybody to get out and away from all of the tragic trauma of the last day and a half,” Meehan said. For the Democrats, the win was bittersweet. Rep. Nanette Diaz Barragán, playing in her first game, said Doyle had decided before the game that if the Democrats won, they would give the trophy to the Republicans to put in Scalise’s office. Doyle didn’t ask for the team’s consent until the late innings, when the Democrats had a comfortable lead. “Mike’s very superstitious,” Barragán said. At a news conference before the game, Democratic pitcher Louisiana Rep. Cedric L. Richmond said his wife reminded him that 90 percent of his conversations with Scalise were about the annual game. 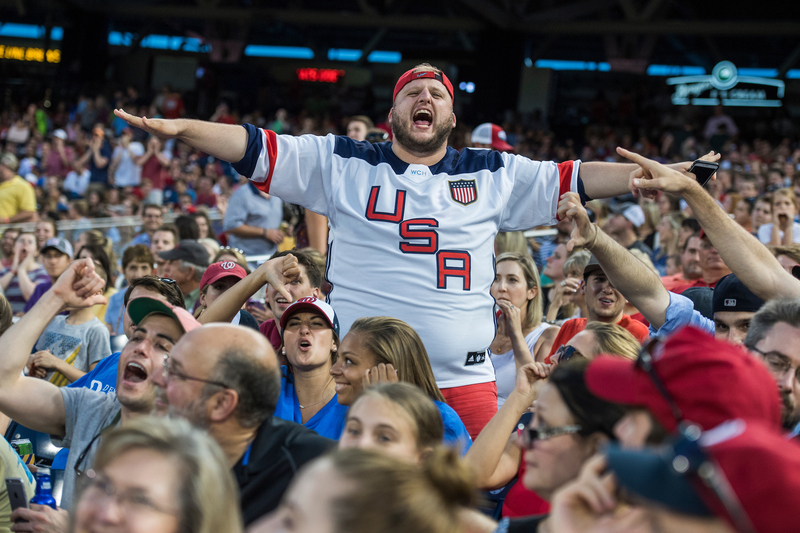 While at past Congressional Baseball Games, members pop in for a few innings or attend parties in the suites, there was an outpouring of members at this game. Everyone from Reps. Pete Sessions, Joseph P. Kennedy III, Robin Kelly, Debbie Dingell, Brian Fitzpatrick, Dwight Evans, Louie Gohmert to all members of leadership — Speaker Paul D. Ryan, Senator Majority Leader Mitch McConnell and Minority Leaders Charles E. Schumer and Nancy Pelosi, Majority Leader Kevin McCarthy and Scalise’s counterpart, Democratic Whip Steny H. Hoyer — were there. Members sat together, hugged one another, chatted throughout the game, and partisanship seemed to not be present. “This is a statement. A statement was made tonight about a lot of things. 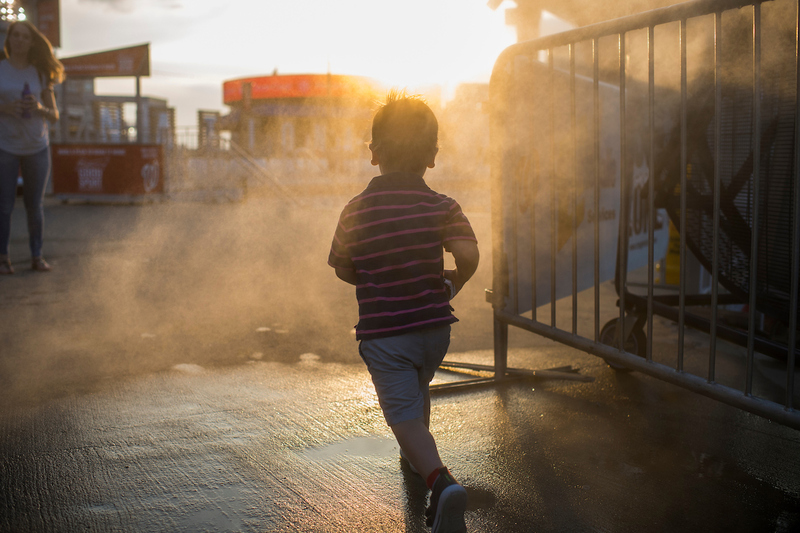 About violence, about political extremism and hopefully the public views us as regular people who are trying to do the best we can in a very difficult world,” Illinois Rep. John Shimkus said. Freshman GOP Rep. Roger Marshall had ordered Scalise’s home state Louisiana State University jerseys for members of both teams but they didn’t arrive in time. But LSU hats did make it before the game, and by the end, several members at the stadium were wearing them. Another last minute change was who threw out the first pitch. Bailey, who along with fellow Capitol Police officer Crystal Griner, who remains hospitalized, was credited with preventing a massacre by taking the shooter down in an intense gun battle, threw it out while on crutches to Roberto Clemente Jr., son of baseball Hall of Famer Roberto Clemente. Griner stood next to baseball great Joe Torre. The crowd cheered Bailey and afterwards members from both teams waited in line to hug him and pray. Before the shooting, the British ambassador was scheduled to have the honors to remember the victims of the recent terror attacks in England. — Bridget Bowman, Kyle Stewart and Griffin Connolly contributed to this report.